The look of the Liberty 1-1/2 in. 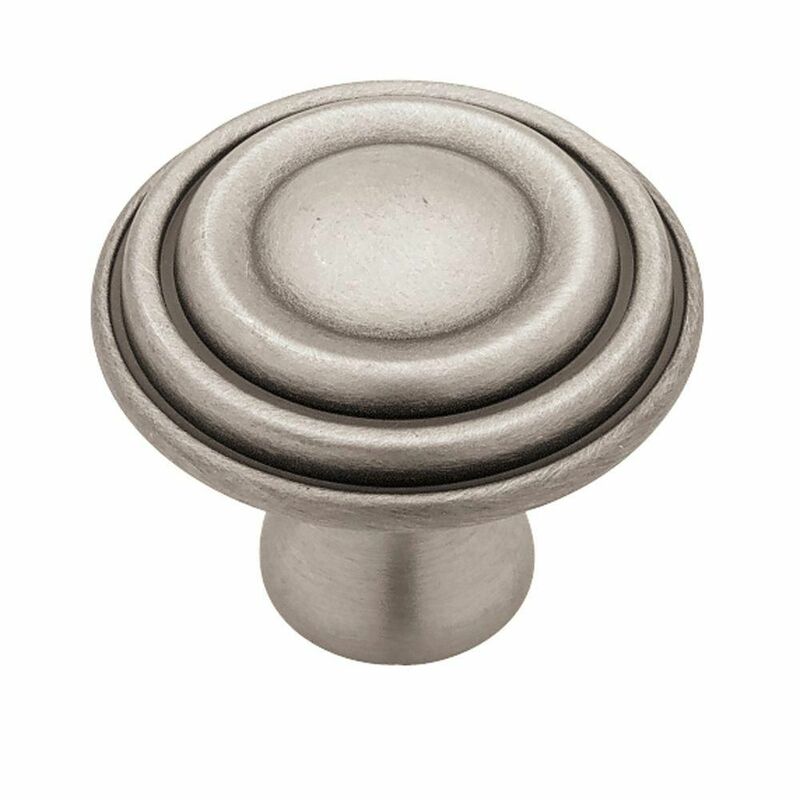 Brushed Satin Pewter Ringed Knob is elegant and contemporary. The brushed pewter finish adds a look of sophistication to your cabinetry. Mounting hardware included for easy installation. This Liberty 1-1/4 in. Satin Nickel Round Knob is made of high-quality zinc die-cast base material. The satin nickel finish is a low-maintenance finish that helps hide scratches. It is designed to work with 3/4 in. drawer fronts and cabinet faces. 1-1/2 Ringed Knob, 1 per pkg The look of the Liberty 1-1/2 in. Brushed Satin Pewter Ringed Knob is elegant and contemporary. The brushed pewter finish adds a look of sophistication to your cabinetry. Mounting hardware included for easy installation. 1-1/2 Ringed Knob, 1 per pkg is rated 4.7 out of 5 by 7. Rated 5 out of 5 by Lois from We purchased these twice because they are so good looking... We purchased these twice because they are so good looking plus excellent quality. Rated 5 out of 5 by JOTJ from Pleased with with the look of this knob. ... Pleased with with the look of this knob. Rated 4 out of 5 by Rose from Easy to install and good quality.... Easy to install and good quality. Rated 5 out of 5 by Laurie from Beautiful and heavy weight these knobs will not disappoint!... Beautiful and heavy weight these knobs will not disappoint! Rated 5 out of 5 by Liza50 from Great Look These cabinet knobs look great and really updated the laundry room. Would definitely purchase again!! Rated 5 out of 5 by Anonymous54 from Classy, Beautiful Knobs We bought these to go on our bathroom vanities and they look gorgeous!! !